It is important to remind the own number. But in the era of Mobilephone operator, most of the people have several sim cards. It is somewhat tough to remember the number of a sim. As there are no visual difference between two sims from same operators. As all the mobile operators provide sim card to their customer, one need to check Balances to their mobile. 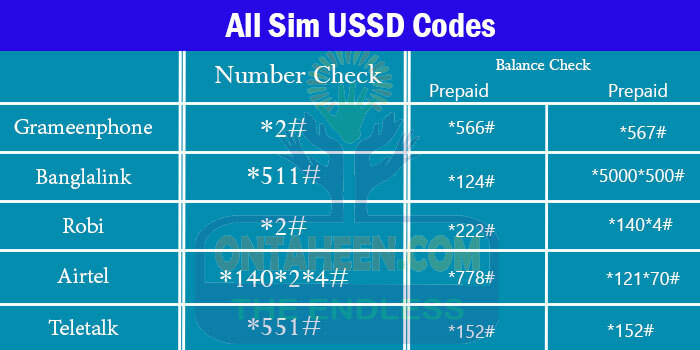 For this purpose, we have provided all USSD code here. Grameenphone is the best mobile operator company in Bangladesh.It is the joint venture of Norway based Telenor and Grameenphone corporation. Almost 43% subscriber of Bangladesh belongs to Grameenphone. Gp provides wide range of minute offers to their customers. One can buy bundle offers from 4 minutes to 1000 Minutes. Depending on the minute amount the cost and validity varied. We have enlisted all Gp Minute offer here.